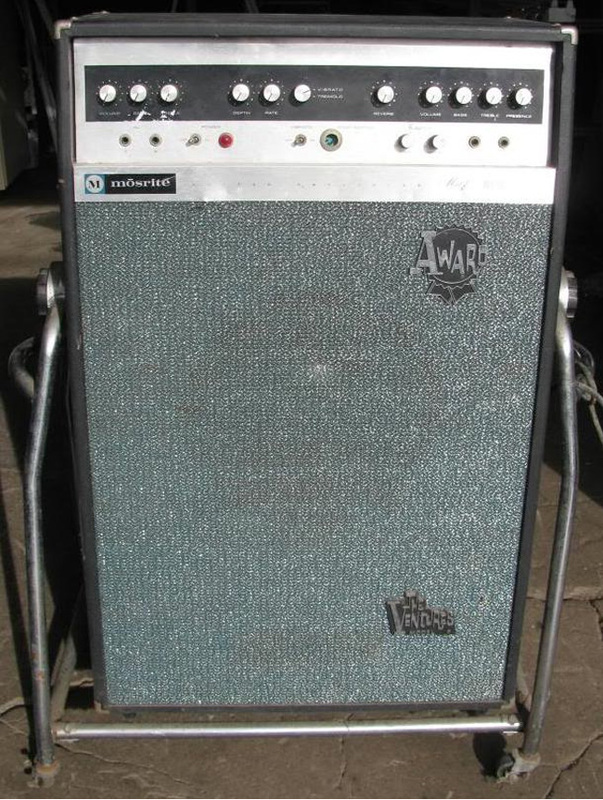 A while back, I bought a giant Mosrite Model 1000 amplifier from Bob Nave, who used to play organ for the Lemon Pipers. In 1968, the Lemon Pipers briefly hit the big time when their song “Green Tambourine” hit #1 on the pop charts. Guitar buffs will recognize its odd lead guitar sound as the rare Danelectro Coral electric sitar. One benefit of the band’s success was an endorsement deal with Mosrite, already a favorite of the band’s guitarist, Bill Bartlett. On the band’s West Coast tour in March 1968, the Lemon Pipers visited the Mosrite factory in Bakersfield, California. Bartlett can still recall the very moment the band stepped into the Mosrite factory and saw its now–legendary owner Semie Moseley. “Semie was jamming with two or three guys in the factory,” Bartlett says. During the visit, Semie gifted the entire band with new Mosrite gear: electric guitars and bodies, a Dobro short-scale bass, and amplifiers, including the giant Model 1000 that I bought from Bob Nave. 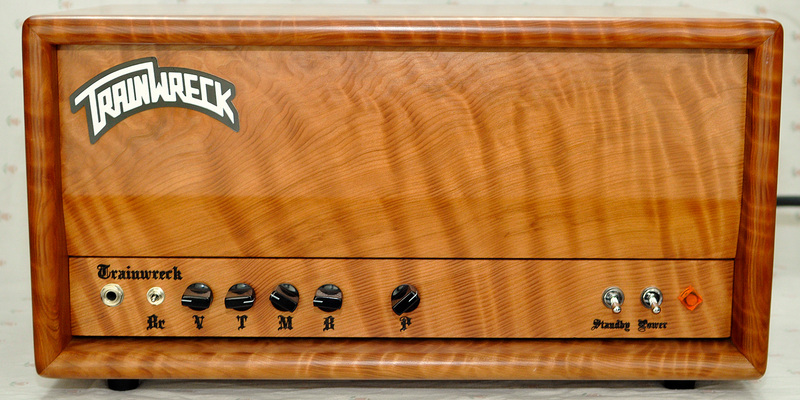 While the story of Mosrite guitars has been much–told, the story of its amplifiers has not. In fact, I was unsuccessful in learning anything substantial about the Model 1000 until I called the former head of Mosrite’s late 1960s electronics division, Ed Sanner. Working at Mosrite from 1965 to 1969, Sanner is best known as the creator of the popular Mosrite Fuzzrite effect pedal. However, he also created many Mosrite amplifiers and is their de facto historian. As Sanner tells it, there were four families of Mosrite amplifiers during the company’s 1965–1969 heyday. First, a then–unknown teenager named Howard Alexander Dumble built a few prototype tube amps. Second, Sanner built a few prototype tube amps. Third are the Mosrite Award solid-state amps from the Ventures’ Mosrite Distributing Company. Fourth are the Sanner–designed Mosrite Electronics solid-state amps. Regarding the Dumble amps, according to a 1985 Guitar Player Magazine interview with Dumble, Mosrite only produced 11 Dumble–designed amps, apparently all piggyback heads. “They were good amps,” says Sanner. “Some of the pros around town were using them.” Today, Mosrite aficionado Bob Shade of Hallmark Guitars only knows of the possible existence of one, which was bought at a San Diego flea market for $10 in the 1990s. When Sanner started working at Mosrite in October 1965, Dumble had just stopped working there. In fact, Sanner replaced Dumble as head of the one–man fledgling Mosrite electronics department. Today, Dumble is a superstar in the amplifier world and is known for zealously guarding the secrets of his amps, to the extent of pouring opaque epoxy on the circuitry. Even then, in 1965, he tried to guard his designs. 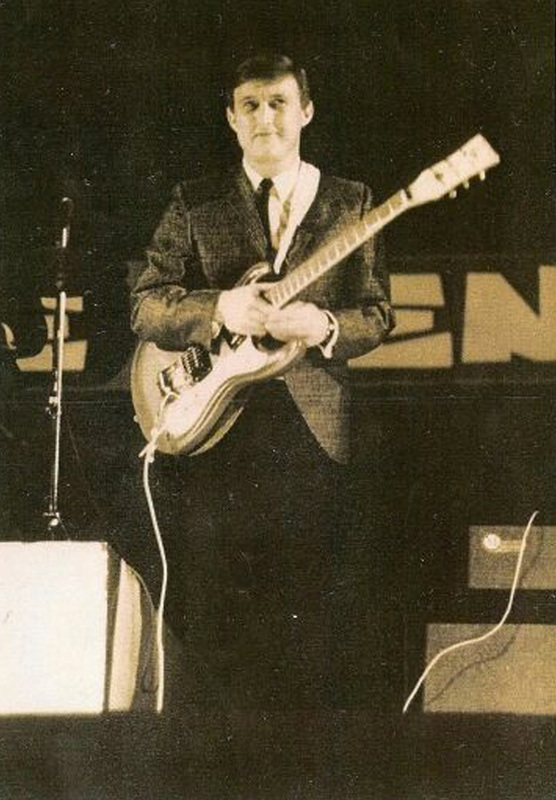 Due to some grainy photographs, some believe the Ventures used a Dumble Mosrite amp head on a March 1966 Japanese tour. Others, like Bob Shade, believe it’s just a Japanese amp disguised with a Mosrite logo badge in an attempt to promote the anticipated, but not–yet–available Mosrite amps. Though solid–state was considered cutting–edge in 1966, Sanner built 10 or 12 Mosrite tube amp prototypes. Mosrite salesmen took the amps to several Hollywood music stores, but were told that tube amps were old–fashioned and that they were “not big enough,” according to Sanner. It is not clear whether any of these Sanner Mosrite tube amps have survived. In 1966, besides Mosrite, the Ventures independently owned an entity called the Mosrite Distributing Company. As Mosrite Distributing Company guaranteed that it would purchase and promptly pay for 100 guitars a month, it served as an essential Mosrite customer. When Mosrite could not meet its demand for a new large solid–state amp, the Mosrite Distributing Company “hired a missile engineer from Vandenberg Air Force Base,” says Sanner. Though not a guitarist, the missile engineer was given a Fender Showman tube amp and given the unfortunate directive of making the same thing with transistors. Branded both as Mosrite and Award amps, the amps designed by the missile engineer are the third family of Mosrite amps. Despite the Mosrite name, they were never manufactured by Mosrite, but by a Minnesota phonograph manufacturer. Known for their groovy turquoise grille cloth, they also feature a Ventures logo badge. “Like Kustom amps, when working right, they sound really good,” says Deke Dickerson, guitarist, author and Mosrite fan. However, due to some fundamental circuit issues, it can be a challenge to get one working right. There were two models: the BG–500 and the BG–1000. Reportedly, 500 of each were made. Marketed as high-end amps, both are combo amps using 15” JBL speakers. 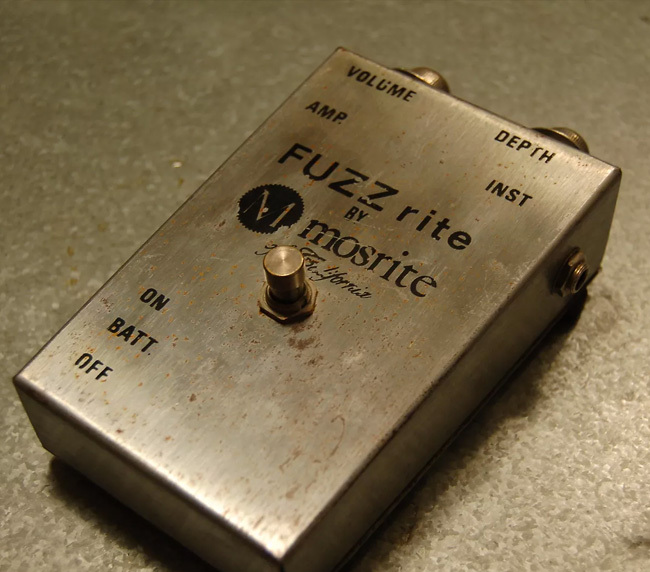 “As an afterthought, they decided to put my Fuzzrite in it, but didn't use my bypass circuit,” says Sanner. Debuting in 1967, Sanner designed the fourth, and final, family of Mosrite amps. During development, Sanner built about four prototypes, at least one of which survives. With these amps, Sanner feels he achieved his goal of an amp matching the clarity of a Standel without the over–brightness of a Fender. Mosrite Electronics manufactured about a dozen different models, plus a slave amp. The models seem to have been: the 200; the 250; the 350; the 400 (two models); the 450 (two models); the 500; the SS-550; the 600; the 900; and the 1000. 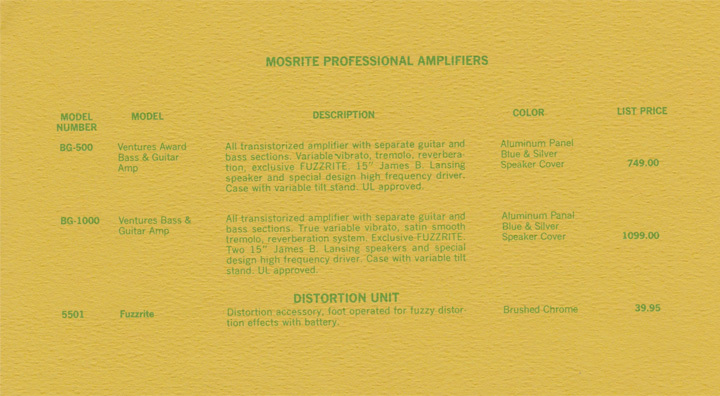 Though the 1968 Mosrite Electronics catalog lists a model 700, none were apparently built. Except for a possible model 450 head, all were combo amps with 15” Altec speakers. Cleverly, the model number corresponded to the suggested retail price. Mosrite only made its own Mosrite Electronics amps for about two years before the company’s sudden demise in February 1969. Unlike Mosrite’s guitars, though, none of its amps ever approached icon status. Finally, while these are the four basic families of Mosrite amps, there are some Mosrite amps that do not tidily fit into any of these families. “Over the years, I’ve just seen more oddball variations than I can almost count,” says Dickerson. One is a large solid–state Mosrite factory test amp used to test Mosrite guitars, possibly built by Semie Moseley’s youngest brother in 1968 or 1969. 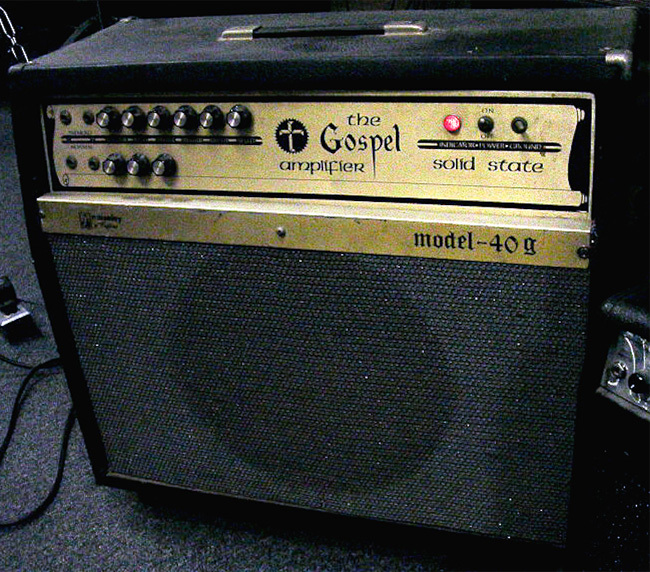 A second is the “Moseley of California” Gospel 40G solid–state combo amplifiers, likely made in 1969 or 1970. A third is Mosrite–branded amps, made by Rosac, probably in the early 1970s. 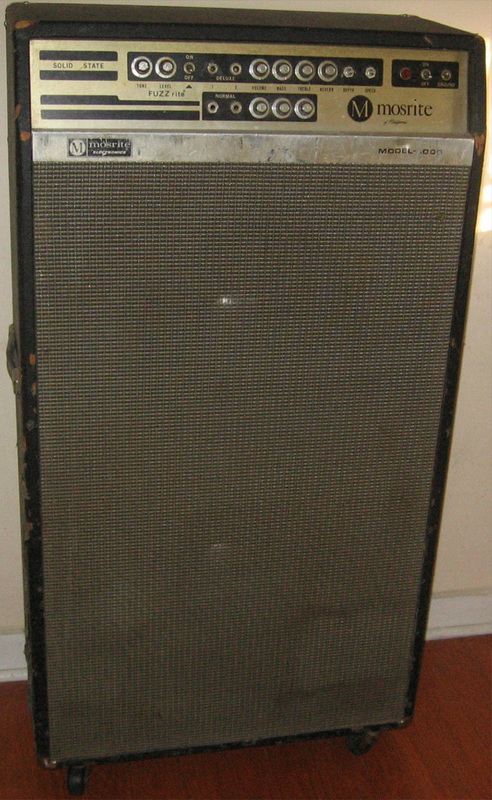 A fourth is a one–off solid-state amp custom–built for Semie Moseley by Ed Sanner in 1976. In recent years, two different Mosrite-branded reissues have been spotted: a US–made “Mosrite Handwired” 40–watt tube amp prototype and a Chinese–made Mosrite Award practice amp. After Mosrite folded in 1969, Sanner worked at Rosac Electronics, designing its highly collectible Nu–Fuzz pedals. In recent years, he partnered with Hallmark Guitars to re–release these effects. Howard Alexander Dumble, of course, went on to create the most valuable guitar amps known to man. The Lemon Pipers disbanded in 1970, but most are reuniting this August for a Summer of Love anniversary show. And I eventually sold my giant Mosrite amp to a Mosrite fanatic who drove across four states in the cold January rain to buy it. This is the story of a Central New Jersey biker who'd go on to design some of the most sought after amps of all time.